Below are the scripts to follow in your email and/or call. My name is [Name] and I live in [City], New Hampshire and I am [list occupation --student, stay at home parent, etc.]. 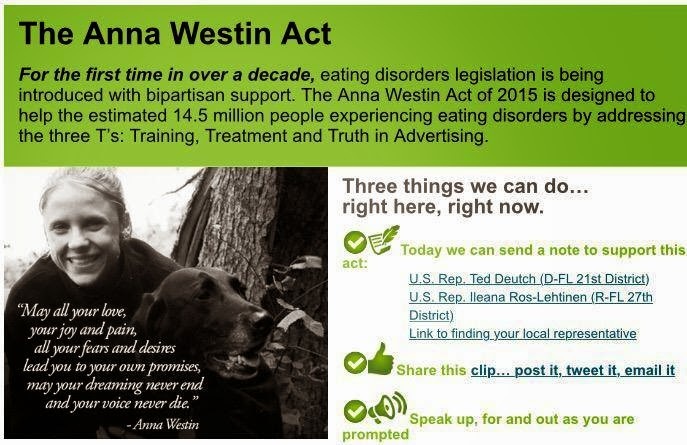 I’ve just heard from the Eating Disorders Coalition that you have shown interest in co-leading the Anna Westin Act of 2015! I am so thrilled that you are interested in taking up this issue that affects so many people, and I highly encourage the Senator to make the decision to take up this issue. I care about eating disorders because [insert brief synopsis of personal story here.] As you may know, Rep. Deutch [D-FL] and Rep. Ros-Lehtinen [R-FL] will be introducing the House version of the Anna Westin Act within the next week. This will be the first time in nearly a decade that eating disorders legislation will be introduced with bipartisan support. I hope that we can do the same on the Senate side, with your support. If you call an office: Remember To Talk Slowly To The Staffer Who Answers The Phone… "Hello, my name is [Name] and I live in [City], New Hampshire and I am [list occupation --student, stay at home parent, etc.]. I’ve just heard from the Eating Disorders Coalition that Senator Ayotte has shown interest in co-leading the Anna Westin Act of 2015! I am so thrilled that the Senator are interested in taking up this issue that affects so many people, and I highly encourage the Senator to make the decision to take up this issue. I care about eating disorders because [insert brief synopsis of personal story here.] As you may know, Rep. Deutch [D-FL] and Rep. Ros-Lehtinen [R-FL] will be introducing the House version of the Anna Westin Act within the next week. This will be the first time in nearly a decade that eating disorders legislation will be introduced with bipartisan support. I hope that we can do the same on the Senate side, with your boss' support. The bill is designed to have a zero to almost zero CBO score. Thank you so much for your time." please let us (The EDC) know if you call/email the Senator's office.